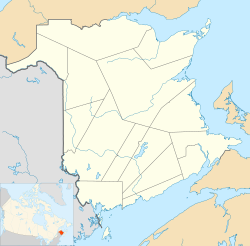 St. George is a Canadian town in Charlotte County, New Brunswick. St. George is nicknamed the "Granite Town" and is located on the Magaguadavic River between Passamaquoddy Bay and Lake Utopia. It is 70 km west of Saint John. The Magaguadavic River flows through the town and into a large gorge and the St. George Dam at St. George, with cliffs on either side, there are also 5 or 6 caves. The town was founded by Peter Clinch, a United Empire Loyalist who emigrated from the United States in 1784. From the late 1800s to the early 1900s, the town was the center for the regional granite industry. Famous for its red granite, a number quarries operated in the area from the 1870s to the 1950s when the last quarry company closed. The town of St. George was incorporated on October 17, 1904. During the Second World War, two military bases were opened near the town: A Canadian Army training base known as "Camp Utopia" and a RCAF/RAF Air base at Pennfield Ridge. By the late 1950s, both bases were closed; Camp Utopia relocated to form Camp Gagetown, later CFB Gagetown, and the airfield at Pennfield Ridge served as the first commercial airport for the city of Saint John. From 1983 to 1985, a tungsten/molybdenum mine operated 40 km north of the town, at Mount Pleasant, and provided a relatively brief economic boost to the community. The mine is currently operated by Adex Mining Inc. but remains in an idle state. In December 2010, the town received national attention with the Magaguadavic River flooded causing damage to structures in and around the town. Today, primary employers are aquaculture companies such as Cooke's/True North Salmon and a lumber mill, Lake Utopia Paper, owner/operated by JD Irving. The Town of St. George is within the Provincial electoral district of Fundy-The Isles-Saint John West and the Federal riding of New Brunswick Southwest. The town is centered mainly between Route 1 to the North, Route 172 to the south-east along the most southern portion of Route 770. ^ a b "NHS Profile, St. George, T, New Brunswick, 2011". Statistics Canada. Retrieved 11 December 2016. ^ "2011 Community Profiles". 2011 Canadian Census. Statistics Canada. July 5, 2013. Retrieved 2014-05-24. ^ "2006 Community Profiles". 2006 Canadian Census. Statistics Canada. March 30, 2011. Retrieved 2014-05-24. ^ "Charlotte County Elections". Heritage Charlotte. Retrieved 18 February 2017.